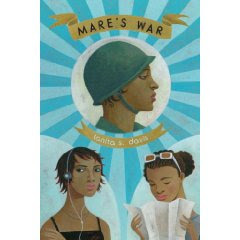 Mare's War by Tanita S. Davis. Knopf Book for Young Readers, an imprint of Random House. 2009. Review copy from publisher. The Plot: All teenage sisters want to spend their summer driving cross country to a family reunion with their grandmother, right? Octavia and her older sister, Tali, are stuck in a car with their grandmother (who prefers to be called Mare, by the way.) There's a thing or two or three they are about to learn, about their grandmother, about life, about each other. The Good: The classic road trip story is tweaked a little bit, bringing in grandmother. So instead of wild and crazy times, it's a journey of discovery. Mare (Marey Lee Boylen)'s story of her teenage years takes her from Alabama to England; because when Mare was a teenager, she ran away from home and joined the Army. No, really; Mare ends up in the 6888th Central Postal Directory Battalion, an all-African American, all-female unit, part of the Women's Army Corps (WAC). The story alternates between the road trip and Mare's teenage years. I have to admit; as the history junkie, it was Mare's story that grabbed me. Mare's War is, of course, World War II. It's also her war with her family. Mare's father died young, and her mother has struggled to keep the family farm at any cost, even if it means Marey dropping out of school and working two jobs. Mare runs away, to grab an opportunity at a life beyond her small town. Then there is Mare's war with the greater world. She may be a WAC; but segregation and racism don't disappear, not in the Army, not later when she is shipped to England and France. And finally there is the war with her own grandchildren, who see her as an embarrassing old lady who doesn't act like other people's grandmothers. How did this teenager become old? Become this old lady? Story by story, this is what Tali and Octavia discover. Along the way, they reconnect with each other and learn, well, all the things you learn on a road trip. Oh, and if you have teens who you know will like this book but may be turned off by the history, because some teenagers eyes glaze over when you say "and it's about women soldiers in World War II!" Simply say, "and then Mare went after her mother's boyfriend with a hatchet." Imagine hearing THAT about your grandma. Disclaimer: Tanita is an online friend; we have never met in person, but I feel as if we have, from her blogs and her posts and her comments. The hatchet comment would definitely get any reluctant reader's attention, I think! Oh and Mare's story (WWII soldier) is what drew me to the book as well! I really enjoyed reading Mare's War. I got a kick out of seeing it on a coffeeshop bookshelf recently (not as a giveaway, but as a book one could read in the coffeeshop). Thanks for the review - I'm so glad you enjoyed it!